Figure 1. Knots and crossings. Beautiful and elaborate representations of knots can be found in medieval Hiberno-Saxon illuminated manuscripts, such as the Book of Kells (probably scribed in Iona, Scotland, around 800 AD) and the Lindisfarne Gospels (thought to be the work of a single monk - Eadfrith, Bishop of Lindisfarne, a tidal island off the north-east coast of England - between 715 and 721 AD). Here the interlaced rho (chi-rho-iota is the abbreviated form of Christ's name in Greek, although the manuscript is otherwise in Latin) from Matthew 1:18 in the Lindisfarne Gospels forms the backdrop for the X-ray crystal structure of the most complex non-DNA molecular knot synthesized to date. Figure 2. A molecular star is born! 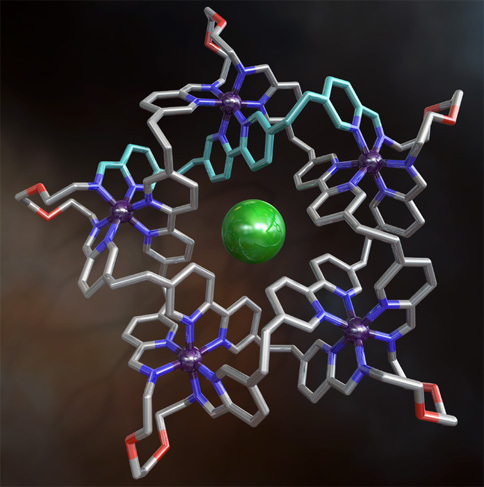 The X-ray crystal structure of a 160-atom-loop molecular pentafoil knot featuring iron ions (shown in purple), oxygen atoms (red), nitrogen atoms (dark blue), carbon atoms (shown in metallic grey, with one of the building blocks shown in light blue) and a single chloride ion (green) at the centre of the structure. 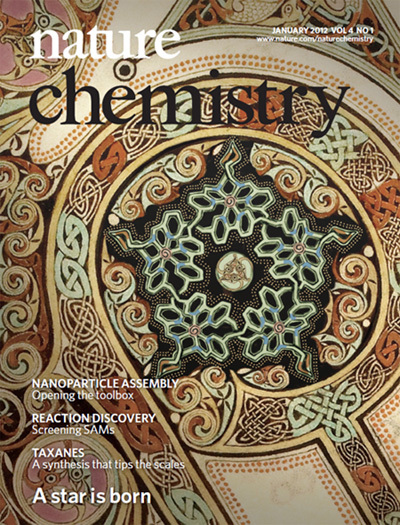 [‘A Synthetic Molecular Pentafoil Knot’ Jean-François Ayme, Jonathan E. Beves, David A. Leigh, Roy T. McBurney, Kari Rissanen and David Schultz, Nature Chem. 4, 15-20 (2012)]. Image credit: Robert W. McGregor (www.mcgregorfineart.com). Knots are found in DNA and proteins and even in the molecules that make up natural and man-made polymers where they can play an important role in the substance’s properties (for example, up to 85% of the elasticity of natural rubber is thought to be due to knot-like entanglements in the rubber molecules chains). However, deliberately tying molecules into knots so that these effects can be studied is extremely difficult. Up to now only the simplest types of knot, the trefoil knot (three crossing points) and the topologically-trivial unknot (zero crossing points), have succumbed to chemical synthesis using non-DNA building blocks. 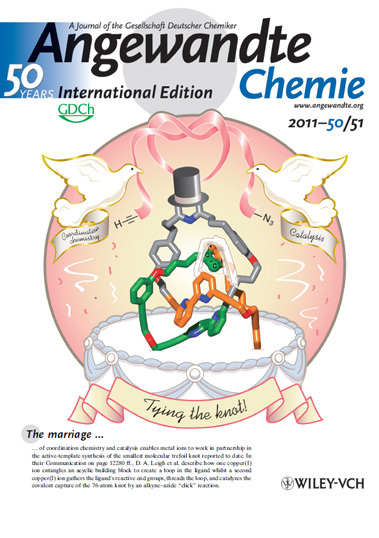 Recently, Professor David Leigh’s team (www.catenane.net) described the preparation of the smallest molecular knot made so far, a 76-atom-loop trefoil knot, a synthesis made possible through the marriage of coordination chemistry and catalysis (see Figure 4). Now the Leigh group have succeeded in preparing a pentafoil knot (also known as a cinquefoil knot or a Solomon’s seal knot)—a knot with five crossing points that looks like a five-pointed star (Figure 3). The structure of the knot (Figure 2 and here) was proven using data collected at the Diamond Light Source synchrotron by the Engineering and Physical Sciences Research Council (EPSRC) National Crystallography Service and solved by Academy Professor Kari Rissanen at the University of Jyväskylä (Finland). The thread that is tied into the star-shaped knot is just 160 atoms in length—that is about 16 nanometres long (one nanometre is one millionth of a millimetre). The researchers used a technique known as ‘self-assembly’ to prepare the knot through a chemical reaction. The building blocks were chemically programmed to spontaneously wrap themselves up into the desired knot. Making knotted structures from simple chemical building blocks in this way should make it easier to understand why entanglements and knots have such important effects on material properties and may also help scientists to make new materials with improved properties based on knotted molecular architectures. Figure 3. Pentafoil knots. The pentafoil knot has symbolic significance in many ancient and modern cultures and religions (as does its two-dimensional projection, the pentagram) and features as the central emblem on the present-day flags of both Morocco and Ethiopia. A, the topology of a pentafoil knot (five crossing points). B, the Moroccan flag. C, a pentafoil knot in edible form! Figure 4. The smallest knot ever tied. This 76-atom-loop molecular trefoil knot was assembled by combining two powerful features of transition metal chemistry: a metal ion’s preferred coordination geometry and its catalytic properties. One copper(I) ion entangles an acyclic building block to create a loop in the ligand whilst a second copper(I) ion gathers the ligand’s reactive end groups, threads the loop, and catalyzes the covalent capture of the knot by an alkyne-azide ‘click’ reaction. [‘Active-Metal Template Synthesis of a Molecular Trefoil Knot’ Perdita E. Barran, Harriet L. Cole, Stephen M. Goldup, David A. Leigh, Paul R. McGonigal, Mark D. Symes, Jhenyi Wu and Michael Zengerle, Angew. Chem. Int. Ed., 50, 12280-12284 (2011).] Image credit: Evolution-Design. The Leigh group have always been interested in trying to find new ways of viewing molecular structures in three dimensions. 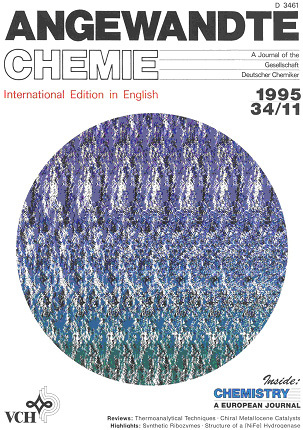 Back in 1995, the X-ray structure of our first catenane appeared as an autostereogram (“magic eye” picture) on the front cover of issue 11 of Angewandte Chemie (Figure 5). Figure 5. Autostereogram (“magic eye” picture) of the X-ray crystal structure of a benzylic amide catenane. Can you see the interlocked molecular rings? (hint: try looking at your reflection in the computer screen, helping you to focus behind the screen, and the image may appear). 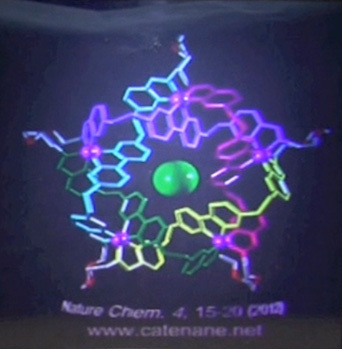 To mark the synthesis of the first molecular pentafoil knot, the Leigh group teamed up with Holoxica, an innovative start-up company based in the Scottish Microelectronics Centre specializing in holograms, to produce the first hologram of a small-molecule X-ray crystal structure (Figure 6). The hologram is a great way to appreciate the three dimensional structure and topology of the molecular knot. Figure 6. The first hologram of a small-molecule X-ray crystal structure. Click on the image to see a video of the hologram. To download the hologram video click here. (a) W. R. Taylor, A Deeply Knotted Protein Structure and How It Might Fold. Nature 406, 916–919 (2000). (b) W. R. Taylor and K. Lin, Protein Knots: a Tangled Problem. Nature 421, 25 (2003). (c) J. R. Wagner, J. S. Brunzelle, K. T. Forest and R. D. Vierstra, A Light-Sensing Knot Revealed by the Structure of the Chromophore-Binding Domain of Phytochrome. Nature 438, 325–331 (2005). (d) W. R. Taylor, Comput. Biol. Chem. 31, 151–162 (2007). M. Schappacher and A. Deffieux, Imaging of Catenated, Figure-of-Eight, and Trefoil Knot Polymer Rings. Angew. Chem. Int. Ed. 48, 5930–5933 (2009). J. E. Mark and B. Erman, Rubber-like Elasticity. A Molecular Primer; Wiley-Interscience: New York, 1988. (a) E. E. Fenlon, Open Problems in Chemical Topology. Eur. J. Org. Chem. 5023–5035 (2008). (b) J. E. Beves, B. A. Blight, C. J. Campbell, D. A. Leigh and R. T. McBurney, Strategies and Tactics for the Metal-Directed Synthesis of Rotaxanes, Knots, Catenanes, and Higher Order Links. Angew. Chem. Int. Ed. 50, 9260–9327 (2011). P. E. Barran, H. L. Cole, S. M. Goldup, D. A. Leigh, P. R. McGonigal, M. D. Symes, J. Wu and M. Zengerle, Active-Metal Template Synthesis of a Molecular Trefoil Knot. Angew. Chem. Int. Ed., 50, 12280-12284 (2011). J.-F. Ayme, J. E. Beves, D. A. Leigh, R. T. McBurney, K. Rissanen and D. Schultz, A Synthetic Molecular Pentafoil Knot. Nature Chem. 4, 15-20 (2012). A. G. Johnston, D. A. Leigh, R. J. Pritchard and M. D. Deegan, Facile Synthesis and Solid-State Structure of a Benzylic Amide Catenane. Angew. Chem., Int. Ed. Engl. 34, 1209-1212 (1995).